The Jerusalem District Police have restricted the entry of Arab worshippers on the Temple Mount, it announced on Friday, due to concerns over a swell in rioting incidents that culminated in a tense clash on Wednesday. Arab men under the age of fifty will be banned from visiting the Mount, a statement said, ahead of the beginning of Shabbat during the week-long holiday of Sukkot (the Feast of the Tabernacles). Police have been deployed throughout Arab majority neighborhoods of Jerusalem and the Old City area as well. 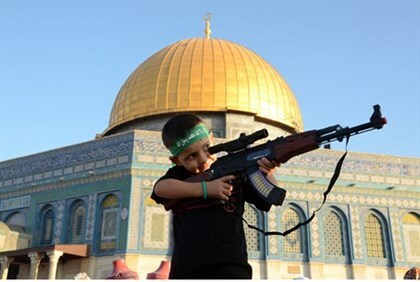 On Wednesday, Hamas vowed to fight on the Mount – which is Judaism’s holiest site – “to the last drop of blood” during Friday’s usual round of riots. The declaration not only follows a “gesture” by which the IDF let Hamas – which has been found to actively fund the rioting – release 500 Gazans to visit on the Mount, but also violent rioting Wednesday which saw Arabs throw fireworks and rocks at police officers. Four officers were wounded and five men arrested during the clash. The Jordanian Waqf has had de facto rule of the Mount since the 1967 Six-Day War, and keeps an iron fist on the Temple Mount and its activities; Jews face constant discrimination and violence for visiting the site, and there is a blanket ban on Jewish prayer there. Muslims, however, have free reign to worship at and visit the Mount, and recently celebrated the Eid al-Adha “sacrifice of Ishmael” holiday there on the same Saturday as Yom Kippur. Unrest on the Mount has escalated recently, as part of a cycle of chaos and violence in Jerusalem known as the “silent intifada” which has seen terrorism in and around Jerusalem rise by a staggering 509%.